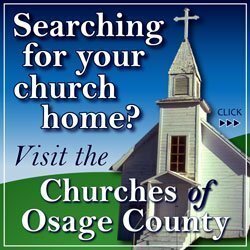 You might not recognize his name, but if your family lived in Osage County more than 100 years ago, you might have Harry Ford to thank for capturing your ancestors’ likenesses, or just glimpses into Osage County’s past. Harrison “Harry” Ford came from the small town of Wright, Mich., which is near Grand Rapids. 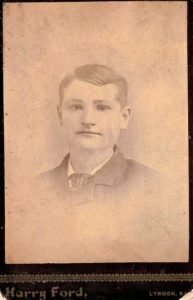 He served his country during the Civil War with Michigan cavalry and infantry units. He mustered out at the end of the war, having been promoted to the rank of first lieutenant. 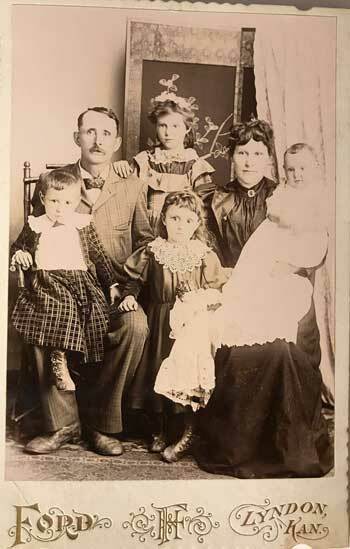 Ford’s photo of a local family possibly includes the sister of Wyatt Earp (anyone who can verify this is asked to contact the author); photo published with permission of Paul Butler. Harry’s arrival in Kansas was first noted in 1880 when he stayed at Patton’s boarding house in Burlington, Kan. Residents of boarding houses at this time would expect to pay from about $2.50 to $3.50 per week. While in Burlington, Harry made a name for himself as an exceptional artist and photographer, prompting some to declare him the best artist in the state. By 1882, Harry was making trips north into Topeka with his photo car. Photo cars could be quite large at 10 by 28 feet and eight feet high on the inside, but lightweight enough to make travel easy on the mules that would be pulling the car. Sometimes photo cars were rented railroad cars converted for this purpose. Photo cars would be furnished with props, fashioning a portable studio. Skylights allowed for natural light and dark curtains were used to block light coming in from the sides. One side would be the location of the photographer’s sleeping quarters and the other a photo lab. 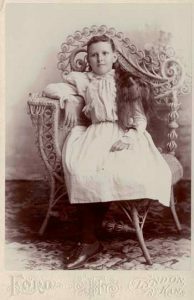 Ford’s portrait of an unidentified boy, from Wendi Bevitt’s collection. Harry eventually established a permanent gallery in Lyndon in 1889, next to the post office. He employed locals such as J. B. Tooley and Lynn Harris. Lynn Harris eventually took over J.E. Bush’s photo gallery in Burlingame. Although Harry then had a permanent gallery, he would still take his photo car to the surrounding communities. 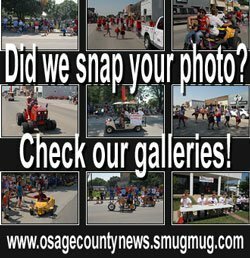 Ford’s photo car would travel to Waverly, Lebo, Melvern, Burlingame, and points around the county and beyond. Arriving to these towns, Harry would stay for a period of time. 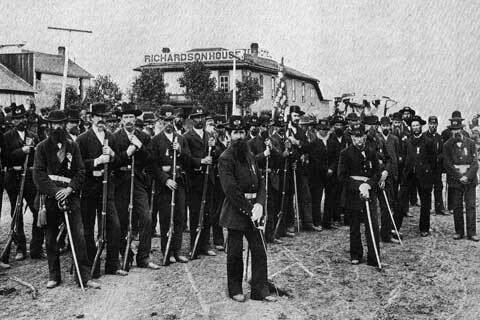 While there, he would capture images of not just the people, but also buildings, community groups, fraternal orders, veterans groups, and events such as Decoration Day. Charles R. Green describes Harry’s photograph of Civil War veterans for his Patriotic Lyndon book. This picture depicts all the veterans in the Lyndon G.A.R. (Grand Army of the Republic), except for Harry, who is on the opposite side of the photographic lens. Ford’s portrait of a young girl, from Wendi Bevitt’s collection. Harry actively tried to make work in his profession easier for himself and others. This led him to invent an automated wash pan for the photographic process that would change the water in the pan from 1 to 20 times during the process, making the procedure simple and effective. He also invented a timing apparatus for photographs that aided in timed printing operations. Harry never married, but he lived among the citizens of Osage County, who surely became like his family for the rest of his life. 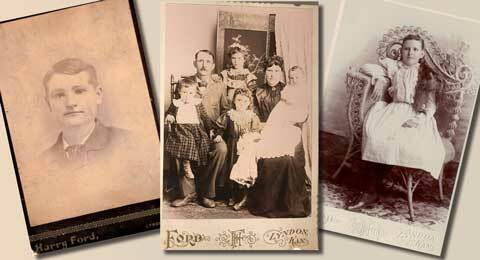 He captured and preserved images of the area until consumption claimed his life in 1905. On a side note, many of Harry’s glass plate negatives were found in his attic after his death. It is believed that most of them were thrown down a well because no one wanted them. Harry Ford’s photograph of Lyndon G.A.R. 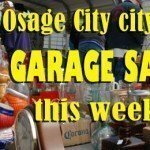 (Grand Army of the Republic) is in possession of the Osage County Historical Society, at Lyndon.